Task idea: Imagine human and Robot are playing together. There are objects in the world and the human is pointing towards one object. The robot then has to guess which target object had been selected by the human like: "Are you pointing to the red circle?". To make things easy, the objects are attached to a wall and the human is is standing next to the wall. 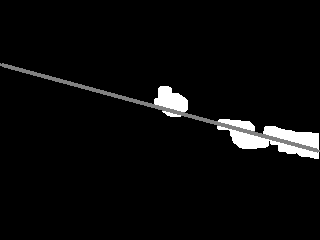 If the line crosses an earlier defined object which was not classified as arm this is the target the human is pointing to. Text-to-Speech is used to let the robot ask: "Are you pointing at the green circle?" 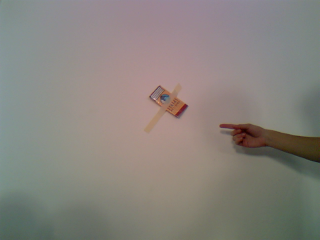 The idea is to have to robot pointing to the same object as the human. 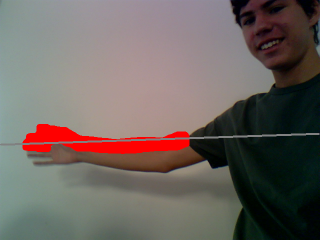 To do this, after having it detecting the pointed object we must calculate joints angles in order to have his arm pointing to that object. 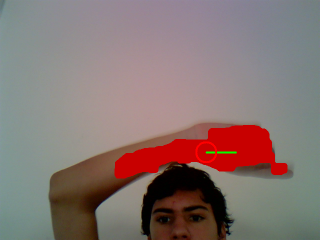 We will do this with a neural network trained on 'natural' pointing postures. 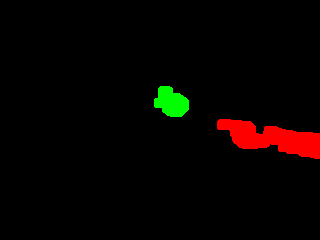 We already done a program that open a port wich act as a neural network, you can train it on whatever you want. This page was last edited on 28 July 2008, at 20:01.